(Nanowerk Spotlight) Among many nanomaterials with distinct geometric shapes, spheres and cubes are the two simplest forms, yet they possess the highest symmetries. One of the obvious geometric merits of this class of materials is their low resistivity under fluidic conditions, as they can be essentially considered as zero-dimensional entities when their size is trimmed down to the nanoscale regime. So far, most hollow interiors of nanomaterials are created by template-methods. Researchers in Singapore for the first time demonstrated that nanostructured polyhedrons of functional materials with desired interiors can be synthesized template-free through a simple hydrothermal method. When geometrically shaped nanostructures are prepared with hollow interiors, they become a class of attractive functional materials, although the complexity of the synthesis increases. Hollow nanomaterials have potential applications across different technological fields, such as photonic crystals, drug-delivery carriers, sensors, or chemical reactors. Other unique features for these isotropic hollow materials include their light weight, because of central hollow voids, and their large specific surface areas, owing to the presence of both interior and exterior surfaces. Dr. Hua Chun Zeng from the Department of Chemical and Biomolecular Engineering at National University of Singapore (NUS) summarizes his recent work for Nanowerk: "In previous work, most hollow interiors of nanomaterials are created by template-methods. Our method is template-free." Basically, there have been two synthetic strategies available for the creation of interior space for nanostructured materials. The first one, template-assisted synthesis, provides an effective approach where hard templates such as polymeric and metallic cores or soft templates such as surfactant micelles or ionic solvents have been utilized. The second one, template-free synthesis, can also create interior space for nanomaterials through various physicochemical processes. "For example" says Zeng, "redox reactions and physical phenomena such as Ostwald ripening, Kirkendall effect, oriented attachment, and hydrophobic interactions have been employed respectively in creating interior spaces in liquid phase." "It should be mentioned that most nanoproducts prepared with template-free synthesis are polycrystalline and are limited only to the spherical morphology" Zeng adds. To exploit the general template-free approach in solution media, Zeng and his colleagues had recently developed two methods for fabrications of nanostructures with interior voids. 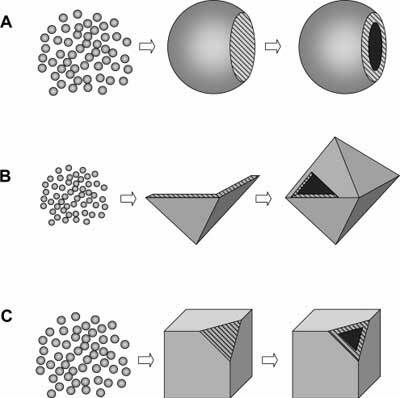 The first method, illustrated in Figure 1A, relies on a three-dimensional (3D) aggregation of primary nanocrystallites, followed by a solid evacuation through Ostwald ripening. The second method (Figure 1B), in which tiny nanocrystallites are gathered two-dimensionally (2D), provides a direct means for construction of hollow structures through a plane-by-plane mechanism. In their most recent work, as depicted in Figure 1C, The researchers from NUS present a third type of methodic concept in this research area. These findings were reported in a paper, "Fabrications of Hollow Nanocubes of Cu2O and Cu via Reductive Self-Assembly of CuO Nanocrystals" and published in the July 12, 2006 online edition of Langmuir. "As a first reported case, our new synthetic method is virtually a combination of both oriented attachment and Ostwald ripening processes" says Zeng. "In the first stage, nanocrystallites undergo oriented attachment to form a well-defined geometrical structure (e.g., the cube). In the second stage, solid evacuation takes place in the central part of the shape-defined aggregate via Ostwald ripening, resulting in single-crystalline hollow nanocubes." The findings of the present work also shed light on the general formation mechanism for solution synthesis of transition-metal-oxide nanocubes with interior spaces.